Jake Ganus proposes to Peyton Thomas after Georgia's win over South Carolina. ATHENS — There were about five minutes left in the game Saturday night when Jake Ganus was pulled from the game. That’s when he started getting really, really nervous. 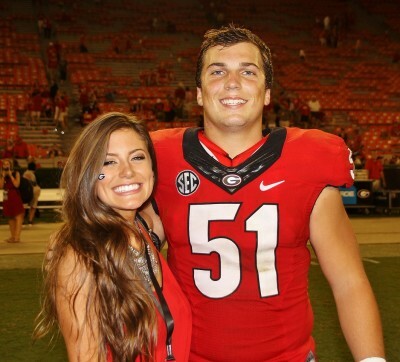 By now most know what eventually happened: Ganus, Georgia’s senior inside linebacker, proposed to his girlfriend, Peyton Thomas, at the 50-yard line after Georgia’s 52-20 win over South Carolina. She said yes, and the story has gone viral. But three days later Ganus filled in a few more of the details. It was not a spur-of-the-moment proposal. It had been planned since the summer, and a lot of people, including Georgia coach Mark Richt, were in on it. The only person surprised by it was Thomas herself. So yes, leading up to and throughout a fairly big SEC football game, Georgia’s starting inside linebacker was well aware that he would be proposing marriage to someone after the game. “I think I did a really good job of not thinking about it at all. I was really focused on the game. I was locked in,” Ganus said. Ganus thought up the midfield proposal back in the summer. He approached Richt with the idea during preseason camp, and it was approved. At some point Ganus picked the South Carolina game, and then it became a matter of logistics. A ruse was devised: Ganus told Thomas that he was “senior of the week” – an award that Ganus said “doesn’t exist” – and that the award-winner gets to take pictures after the game at midfield with their family and friends. The parents of both Ganus and Thomas were invited, and they were in on it too. The only person unaware was Thomas herself. Just to add to the subterfuge, the girlfriend of Kolton Houston, the sixth-year offensive tackle, texted Thomas to say she did it last year and it was a lot of fun. Ganus also told that Thomas that “senior of the week” only happened after a win. All part of the contingency plan. But when the game ended the whole thing was a go, and Thomas and the couple’s families joined them. The two had been together for six years, and knew each other for seven years. They haven’t set a wedding date yet. Of course not everyone was happy.